This March marks a few significant milestones. Top of the list is that momentous day in history when HRH Sultan Ibrahim was crowned the fifth sultan of modern Johor, the very same day Singapore’s founding father, Lee Kuan Yew, passed on. On the family front, it was also when my parents met their first great-grandchild, Vivienne, for the very first time. On a road trip North this 3-month old infant went on to visit her 103-year old great-great grandmother. This month also marks the fourth anniversary of this blog, My Johor Stories, which is poised to be re-launched as a boutique blog and the go-to news and info portal for Johor. March was also an emotional month as we in Johor Baru – Singapore’s immediate neighbour – were lifted up with euphoria at our sultan’s coronation and plunged in grief at the passing of their leading statesman. Watching the news coverage on Channel News Asia and reading poignant posts on social media, I’m reminded of 1997 when I arrived in London in early September right smack into the national grieving for the loss of their beloved Princess. I can never forget the sight of the area in front of the gates of Kensington Palace that turned into a sea of flowers and tributes. I was so moved that I went to the church in the village where my sister and family lives, to express my sympathies in the condolence book there. One of the fine examples of national unity that we can learn from our neighbouring nation is how people, regardless of race, beliefs, age or gender, turned up to pay respects to their departed statesman. The non-stop long lines waiting in orderly queue for hours, round the clock over several days, simply says something about that person whom they needed to bid a final farewell to and how he has united these diverse groups of people. Sharing their grief and loss, I did the little I could by going to sign the condolence book set up at the Singapore Consul office in JB. Vivienne and her toothless grin! Prior to this, I was immersed in writing what I call “sultan stories” to commemorate the sultan’s coronation and I’m particularly proud of our Johor Sultan who took time out to go to pay his respects just days after his coronation. I deeply appreciate that he did not consider it a taboo to attend a funeral wake while he was in the midst of his own grand celebration. His selfless act truly defined him as a man and Johor’s strong relationship with the island state. The quiet dignity in the send-off was seen via a live telecast on Astro Awani channel but the reactions from some viewers sadly proved that they are not only prejudiced and shallow but shamefully racist. It’s doubly sad that these unhappy viewers did just not change the channel or turn off their TV sets if they didn’t want to watch. I remember avidly watching live telecasts of the funerals for Princess Diana and Whitney Houston because it was of personal interest and purely news-worthy. As we share the grief of our neighbouring nation, my thoughts are on grandma, our Real Champion, who is kept clean and comfortable in the twilight of her life. Her health has been deteriorating since late last year and as she refuses to eat or drink, she is losing weight quite rapidly. At the ripe old age of 103, her mutterings are mostly incoherent but on good days, some of the names she calls out sound quite clear. So I took the opportunity to visit her again – this time with her eldest son, Uncle Roland, and her eldest daughter, my mum – the two names grandma was often calling. Five generations of females in our family! For me, it was a worthwhile trip even though it was a too tiring drive to USJ via Kota Tinggi where uncle lives. The newest addition to our family, my grand-niece Vivienne, was born in Perth last Dec 22 and when she was strong enough to fly her parents brought her to meet us in JB. Vivienne’s visit coincided with her aunt’s wedding held in Kampar and it was an opportunity for the visiting young family to revisit Penang and Cameron Highlands with a stopover at USJ, where her great-great grandma lives. It was particularly meaningful for five generations of females to be in the same room and even though I could not join them for the trip, I insisted that they must seize the opportunity to capture the moments with many photos! I was, meanwhile, busy with events and travel assignments. At an event at the Johor Baru Convent, I took the opportunity to snap a few photos of the façade – this time repainted a ghastly shade of yellow – and saw the plaque put up at the foot of the school’s iconic statue of the Virgin Mary that reminded me that the previous Sultan Ibrahim presented it to the school. Incidentally, this school will be celebrating its 90th anniversary in August. In line with the royal mood this March, I made a trip to Muar – Bandar Maharani – the royal town, for a walkabout and stayed in a spanking new hotel creatively built with three stacks of containers. More about this in a separate travel story but first, I must point out to the relevant authorities that: Pavements are for pedestrians. My walking tour was severely impeded by a series of large jars placed in a row on the pavement that borders a busy road. The presence of these jars made it impossible for any pedestrian to walk along the pavement so I was forced to walk on the road that was full of vehicular traffic. I hope the town council will remove the jars so that this and other similarly cluttered pavements can be cleared for the pedestrians’ use. At the end of the month I visited Desaru again with a group tour and had the pleasure of meeting old friends at the Desaru Fruit Farm and Ostrich Show Farm at Teluk Ramunia. Over the years I have been back to the fruit farm several times and each time I visit, I’m impressed with the progress they have made here. But it was about five years since I was last at the ostrich farm for the second time. So it was good to meet Colin Teh and his wife, Joyce, again and see how they were helping visitors to enjoy the experience with their big birds. I saw the outer front wall of their souvenir shop decorated by a collage of laminated newspaper articles on the farm and it was hard not to miss my story (two pieces posted! ), All about big bird, dated 1 Dec 2008! I’m delighted with the privilege to share Johor stories in various publications and the time is now ripe for a revamped My Johor Stories in a blog that promises to be easy to navigate and easily accessible on a range of mobile devices. So look out for an exciting change, happening very soon. When I read about the Johor Sultan’s coronation on March 23 with the many celebratory events, I feel a ripple of excitement because we are witnessing a momentous day in the history of Johor. Unlike past coronations that were witnessed only by royalty and dignitaries, now the rakyat can also be a part of the event because the coronation of Sultan Ibrahim Almarhum Sultan Iskandar as the fifth ruler of modern Johor will be broadcast live on TV and big screens at Dataran Bandaraya Johor Baru. I must confess that I’m caught up with the royal fever that’s sweeping through the state as the rakyat eagerly anticipates the coronation followed by a traditional royal motorcade through the city. They will also enjoy boat parades on the Johor Straits, sports, music and cultural carnivals at Danga Bay and thrill to spectacular fireworks. Burning with royal fever, my recent bedtime reading was history books like, JOHOR, Local History, Local Landscapes 1855 – 1957, a book by historian and great-grand-daughter of Wong Ah Fook, Datin Patricia Lim Pui Huen, and A History of Johore by R. O. Windstedt, former British General Advisor in Johor. While reading about the founder of Iskandar Puteri, Temenggong Daeng Ibrahim, and the rulers of modern Johor, I discover the stories behind the hills and palaces in the state’s early history. I realise that while palaces like Istana Besar and Istana Bukit Serene will be in the spotlight for the coronation, JB has a number of historic hills and palaces that we know little about. A glimpse of these notable and obscure names is aimed to intrigue you to find out more about the wealth of heritage sites and buildings here. When Temenggong Daeng Ibrahim gained sovereignty over the territory of Johor in 1855, he claimed the most suitable site along the coast for a new state capital and named it Iskandar Puteri. To mark the event, a flag was put up on the hill which was called Bukit Bendera or Flagstaff Hill. Today the Johor flag still flies from the same spot on the hill which was renamed Bukit Timbalan after the site was used as a fort by Askar Timbalan Setia Negeri Johor. Map of Istana Besar or Grand Palace and its vicinity, 1902. Just before the Second World War, three distinctive buildings were completed, each with distinctive features that distinguished them from other buildings. 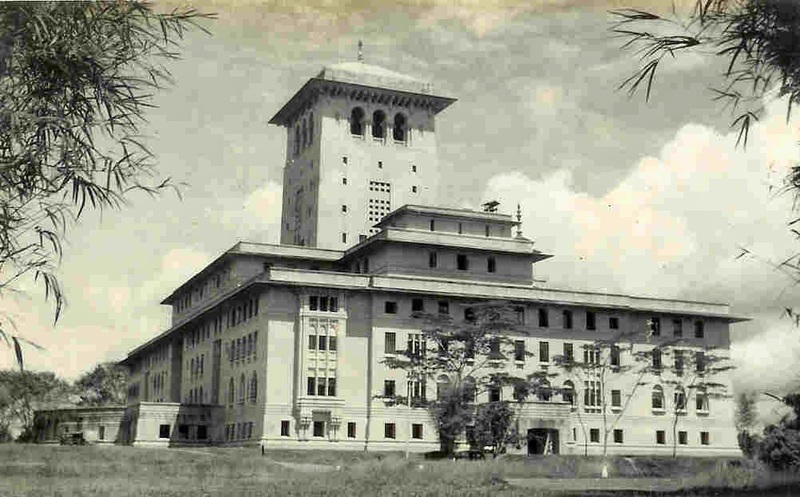 Work on the State Government Secretariat started in 1939 and this impressive structure on Bukit Timbalan, now known as the Sultan Ibrahim Building, dominates the city skyline and remains an iconic landmark in JB. A 1902 map of Istana Besar indicates that this magnificent palace was built near Bukit Bintang and has two grand entrances with imposing facades, each characterized by an impressive flight of stairs. As boats were the only means of transport from Singapore, a long flight of stairs on the seaward side leads up from the water while the broad flight of stairs from the park leads directly to the Throne Room. This main entrance, used particularly for official and ceremonial events, will once again be a focal point at the sultan’s coronation on March 23. In 1889, the royal family relocated from Telok Belangah in Singapore to Istana Zaharah in JB. Built on Bukit Zaharah, this palace was named after Sultan Abu Bakar’s younger sister, Ungku Zaharah. The adjacent Balai Zaharah was an audience hall, popularly known as Balai Cengkih not only because it was decorated with ornamental designs of the clove (cengkih) plant but also because the building structure has four projections shaped like the stem of the clove. Nearby, at Bukit Mahmoodiah, stands the imposing structure of the Royal Mausoleum in Kampung Mahmoodiah, the final resting place of the royals. The first and most impressive of the public buildings constructed at this time was the state mosque, named Sultan Abu Bakar Mosque, on Bukit Redan. The hill got its name from Redan trees growing here that bore edible fruits similar to the rambutan. This elegant mosque with four graceful minarets was officially opened by Sultan Ibrahim for Friday prayers on Feb 2, 1900. Saujana, a sprawling bungalow built on Bukit Saujana, was originally the official residence for the General Advisors to Johor. Historically, Johor developed quite independently and held out against accepting a British Resident until the 1910 appointment of a General Advisor. Saujana is now the official residence of Johor Menteri Besar or Chief Minister. Bukit Lallang, a hill covered by lallang, a tall common weed, is situated further down Jalan Abdul Rahman Andak, the site of Sri Lallang, the residence of Johor’s first state secretary, Datuk Amar DiRaja Abdul Rahman Andak. At his demise in 1930, Sultan Ibrahim’s sister, Tunku Ampuan Besar Mariam renamed the palace, Istana Mastika Embun or Palace of the Radiant Jewel of Dew, when she moved in. The building was later used as the Tunku Ampuan Mariam College and is now occupied by an Islamic primary school, the Sri Johor Bahru School. In 1928, the residence of Ungku Khatijah, sister of Sultan Abu Bakar, was completed on Bukit Cengkih. The hill, situated close to the JB General Hospital, earned its name from the clove (cengkih) plantation here. After her demise, the palace was renovated for use as the hospital’s Officers’ Ward and now as the Hematology Ward. Her royal emblem is still on the building façade! The hillock between Jalan Mariamah and Jalan Petri was named, Bukit Jepun, because the Japanese built a bunker here during Second World War. Buildings on this hill are now occupied by the offices of Yayasan Warisan Johor or the Johor Heritage Foundation. Bukit Kurnia on Jalan Ismail off Jalan Yahya Awal was technically not a hill but the former home of Indian Muslim lawyer, M. Ismail, a senior member of the Johor Bar and a member of the Council of State. Located behind a petrol station opposite the Johor Baru Convent, it was used as a Russian restaurant in the 1970s and until recently, occupied by Sri Andalas private school. Sri Gambir, the official residence of Johor’s first Menteri Besar, Dato Jaafar Mohamed, is located on Jalan Dato Menteri 1/1 at Bukit Gambir, a site between Jalan Yahya Awal, Jalan Gertak Merah and Jalan Mahmoodiah. After the Jaafar family moved out, Sri Gambir was occupied by a club for the members of the Johor Civil Service and from 1984, by the Johor Library Corporation. It was vacant since 2004 and has fallen into a sad state of disrepair. In 1893, Dato Jaafar built another home at Bukit Senyum which was modeled after Hardwick Hall, an Elizabethan country mansion with four square towers that belonged to the Duke of Devonshire. It is believed that he named the mansion, Senyum (Malay word for smile) because when he sought permission from Sultan Abu Bakar, the sultan conveyed his approval with a smile! After Dato Jaafar’s demise in 1919, the building was renamed Dato Jaafar Building, and used for various purposes and recently reopened as a museum. One of the more recognizable hills in the city must be Bukit Cagar, the site where low-cost flats were cleared for the construction of Johor Baru Sentral and the Sultan Iskandar Customs Immigration Quarantine Complex. This site is also earmarked for the JB terminal of the proposed Singapore-JB Rapid Transit System. In 1860 a steam sawmill was set up at the mouth of Sungai Segget by Scotsman, James Meldrum, the site of the former customs and immigration checkpoint. Jalan Sawmill and Bukit Meldrum were named after the founder and owner for his contributions to Johor’s development. Iskandar Hall, his residence on Bukit Meldrum no longer exists but the site is now occupied by the Grand Blue Wave Hotel and other hotels and shops. Four Towers, was a replica of the Dato Jaafar Building. This site is now occupied by the Straits View Hotel JB. Bukit Tanjung Puteri was leveled to build the former Customs Department’s JB office and after it was demolished, the site is being redeveloped. Bukit Stulang, a hill near the Zon, was the site of a state government VIP guest house that once was a palace. On the other side of the causeway, the site where the Straits View Hotel stands was Bukit Seri Manggis, a hill that faces the deep water mooring place called the Tambatan. The palace that once stood here was named Istana Tambatan, also known as Istana Pantai, the Palace by the Beach, or Gedung Empat Menara, the Mansion of Four Towers – in a design similar to Bangunan Dato Jaafar. A hill near Wisma Persekutuan was named Bukit Kopi because it was a coffee plantation and the residence of Mohd Khalid Abdullah Munsyi at nearby Jalan Dato Dalam was nicknamed, Sri Kopi. At his demise, his home was used as a school named Sri Kopi Malay School. The school moved to Bukit Saujana in 1934 and was known as the Saujana Malay School. In 1935 the school finally moved to premises built on the site of Johor Dato Bendara Dalam, Datuk Munsyi Muhammad Ibrahim Munsyi Abdullah’s old home at Jalan Ayer Molek and renamed Ayer Molek Malay School. It’s now known as Sekolah Kebangsaan Ayer Molek. Bukit Polis, so named because it was the former site of the Police Headquarters, is located opposite the Puteri Pacific Hotel where the Telekom Malaysia Johor headquarters now stands. Two kampungs to the north of the city developed around Jalan Wadi Hana and Jalan Sekolah Arab, at the site known as Bukit Sekolah Arab. The Arab community had a role in JB’s history because they not only brought along their skills and business acumen as traders but also a deep knowledge of Islam and an interest in promoting religious education. was first occupied by Principal Medical Officer, Dr G. H.
A closer look at the 1902 map of Istana Besar and its vicinity revealed interesting points of interest including more palaces that have ceased to exist. Istana Marbal, a palace named after Malborough House in London, was first occupied by Principal Medical Officer, Dr G. H. Garlick, and then by Tunku Abu Bakar, the second son of Sultan Ibrahim. The other is Istana Persemayaman or Istana Semayam, the residence of Sultanah Fatimah, the consort of Sultan Abu Bakar. It was also used as the residence of the General Advisors and later Sultan Ismail occupied this palace when he was Tunku Mahkota. Now only the steps remain. Sultan Abu Bakar’s preferred residence, Istana Zaharah, was destroyed during the Second World War but the surviving audience hall, Balai Zaharah, has been given a new lease of life and restored to its former grandeur for use at the sultan’s coronation. Besides the grand palaces, JB certainly has some beautiful heritage buildings and pre-war shops with social and economic value that can be successfully put to adaptive use. I hope this glimpse into Johor’s rich history will encourage people with a common passion for conservation, to work together to preserve the character of our city. When my story, Two Wongs of Senai was published in Streets Johor (NST 12 Sept 2014) I received a message from Senai girl, Wong Man Chen, whom I met to do a story on her visually-impaired husband (NST 20 July 2014). She could relate to my story because she used to go to the South Johor Wong Association’s annual event for students with outstanding school reports. I learnt that students who performed with excellence continue to receive rewards to encourage them and felt glad that a new generation of people in Senai are still benefiting from the Wong association’s contribution to the community. I had written about the Wong association building at Lorong 1 in Senai, Johor, known as Jiang Xia Tang, a sprawling mansion that was built in 1937 by one of the founding fathers of Senai, Wong Piang Nam. 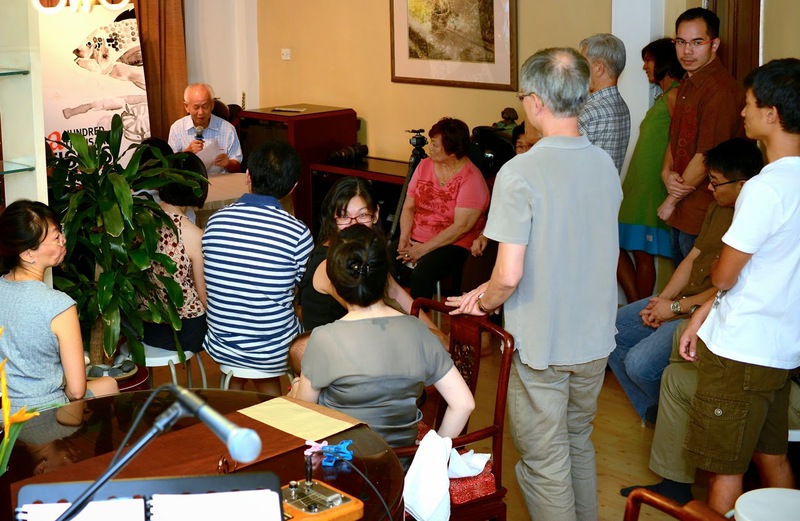 Then in November 2014, I was pleasantly surprised to receive an email from David T C Loo, who introduced himself as a retired pastor with the Malaysian Methodist Church and his wife, Wong Ju Nee, who was a grand-daughter of Wong Piang Nam. He said while he retired in Kuala Lumpur, almost all the Wongs live in Singapore now. As the family has not visited Senai for a long time, he also thanked me for the recent photos published with my story that gave him a glimpse of the development in Senai. Then he told me that his brother-in-law, Linus Wong Tian Ching, published a book with his recollections about grandfather Wong Ping Nam and his legacy entitled, A Hundred Thousand Fishes that was launched on his 80th birthday in July 2013. Loo also introduced me to his sister-in-law, Wong Lee Lin, and invited me to write her in Singapore to set up an appointment to meet with the author, her eldest brother, for first-hand stories about their grandfather or Ah Kong. I was thrilled to learn that they have a written record of their family history and I wanted to get my hands on that book. From a quick search in Google, I had to be satisfied with a peek of the book cover and some painted illustrations. I wasted no time to write to Lee Lin and she welcomed me to meet with her brother in Singapore. She was instrumental in getting the book published and it is a priceless record for the family to better appreciate the hardships and struggles their forefathers went through to get them where they are today. Lee Lin graciously shared a softcopy of, A Hundred Thousand Fishes, with me and I had the privilege to read it before meeting her with the author and his wife, in Singapore. Born in 1867, Wong Ping Nam, a Hakka who hails from Her Po village in the Guangdong province of China, was sold as a migrant worker at age 17 to work as a tin miner at Belitung Island in Indonesia. It was a rags-to-riches story where Wong worked hard to ultimately own his own tin mines and in 1926, he decided to seek his fortune in another land and moved north to Johor in then Malaya where he and his followers settled in Senai. Wong and his followers cleared the jungles around Senai to plant rubber and pineapple, crops that had replaced pepper and gambier as the most important plantation crops in Johor. Wong, who used the trade name Wong Tack Maw, was a wealthy entrepreneur who owned 1,000 hectares of land in Senai that was cultivated with rubber and pineapple. He lived in a sprawling mansion built within the Wong Tack Maw plantation while he developed Senai into a commercial centre. The theatre and two rows of shophouses along the main road may have been the earliest brick buildings constructed in this small town that developed around a network of roads. Built in 1934, the theatre bears the inscriptions “Senai Hall” and “Wong Tack Maw,” the trade name of Wong Ping Nam, and still stands between two blocks of shophouses, designed with similar washed granite finishing, along the Senai main road. In 1937 a replica of his plantation mansion was built at Lorong 1 and Wong, a benevolent entrepreneur, opened it as a shelter for new immigrants who could stay until they found their footing to settle in a foreign land. The Chinese often apply the ancient art of Feng Shui to achieve harmony but it’s unknown why Wong decided to name the mansion, Jiang Xia Tang because the word, tang means “hall” as in ancestral halls that honour the departed. Paralysed from a stroke, Wong passed away in his plantation mansion in 1940, just before the Japanese arrived in Senai, in the Second World War. The other pioneering Wong of Senai, Wong Ji Song, an entrepreneur in the transport business, prospered the town by transporting mainly rubber and pineapple products to Singapore. After the Second World War, he established the Johor Jiang Xia Tang Mutual Help Association in 1947 which evolved into the present day South Johor Wong Association in 1970 and members joined from JB, Kota Tinggi, Kluang and Pontian. In 1951, the association proposed to buy Jiang Xia Tang and the sale was formally completed in 1978. These premises are now used as an ancestral hall for the Wong clan and a clan house for community events and celebrations. I meet Linus, 82, and his wife, Alice, in Lee Lin’s home for a further insight into A Hundred Thousand Fishes, a written legacy that he has dedicated to the descendants of Wong Ping Nam. Having read his book and from my own family’s experiences, I can relate to many of the scenarios he described in pre-war days, their escape to safety during the Japanese invasion as well as the challenges in rebuilding their lives in the post-war period. As the eldest child, Linus made a great deal of sacrifices to benefit his extended family and because their schooling was interrupted during the war, he fought hard to complete his education so as to have a career and earn a steady income to support the family. While Ah Kong was still alive, Linus’ father, Wong Siew Chin, the eldest son of Ah Kong’s second wife, Sim Kee Lan, managed their plantations well and regularly sent funds back to support their family in Her Po village, China. He said Ah Kong owned some 200 shophouses in Senai and his wealth was so vast that it was believed that there was an entire room filled with gold ingots. Linus recalls they had a well-stocked kitchen to provide for the family and Ah Kong would forbid them to buy any outside food because they already had plenty of food at home! 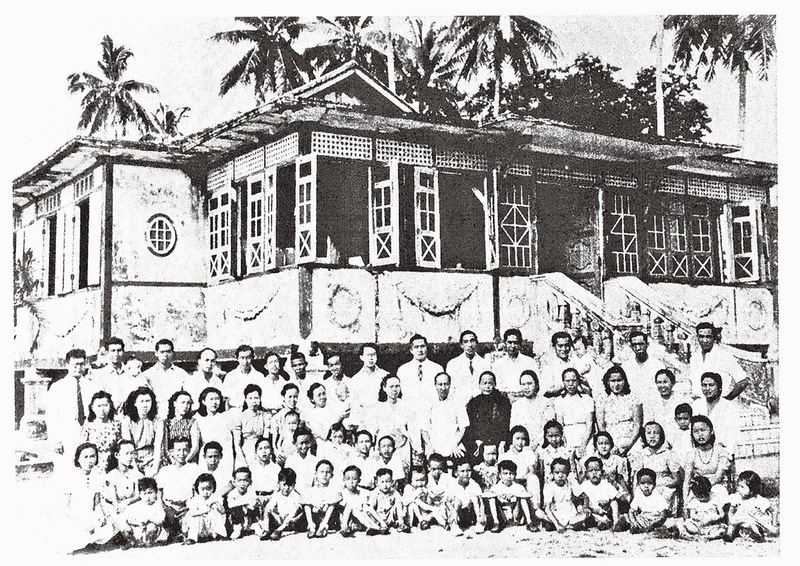 When the World War II reached Malaya, schools were closed in Singapore and they moved back to their bungalow in the plantation which had turned into a refugee camp for hundreds of people who were sheltered in temporary long houses. His father became a hero of sorts as the plantation not only provided shelter but also food. They planted acres of sweet potatoes, tapioca and vegetables in between rows of young rubber trees and meat was usually wild boar meat shot by his father and his workers. Later in life, however, his father did not manage their money well and this resulted in the loss of the wealth amassed by Ah Kong. 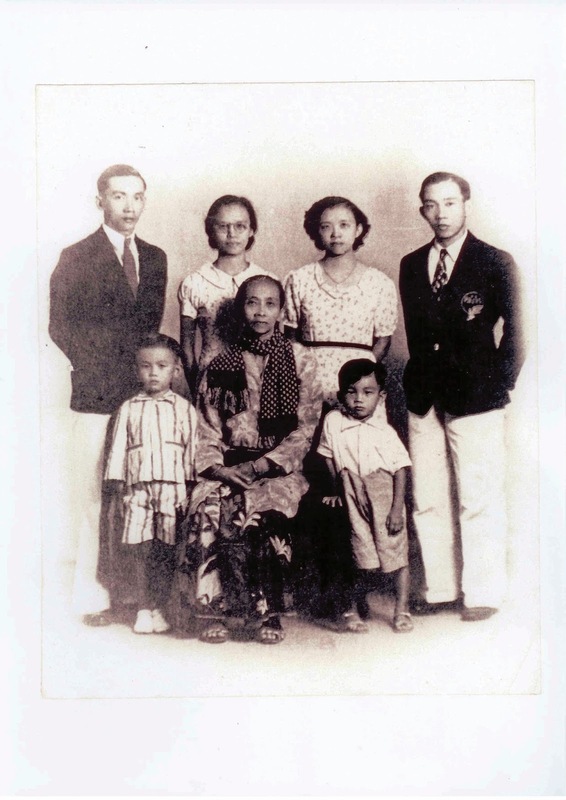 The Wong family escaped certain death by leaving Senai just a week before the Japanese arrived. A senior Japanese officer was ambushed and killed by guerrillas in another plantation and while the Wongs were safely in Singapore, they heard news of Japanese retaliation with the massacre of hundreds of lives in the plantation. After the war, the family returned to Singapore where Linus worked hard to qualify as a teacher and excelled in teaching Science. In 1960 he published his first series of Science books used for the Primary school syllabus. He often reminisced about Ah Kong’s fortune in Senai and attributed the collapse of his empire to the Japanese invasion, and when Lee Lin suggested that he write it out as a record, he agreed. He started writing using his Royal brand manual typewriter but because suppliers no longer stock that typewriter ribbon, Linus completed his draft by hand writing. The draft was transcribed by his daughter-in-law, Jillian Martens, edited by Lee Lin, with illustrations by her daughter, Anya Ow Si Ying. “This book is written not to regret the past but instead to recognise the successful life of Ah Kong and to learn the good aspects of his life. It is also to record the lives of some of the descendants of Ah Kong during and after the war. It is my hope that the descendants of Wong Ping Nam, in reading this book, can enjoy it, learn from it and live as God-loving people, rich in a life of love for the family and close friends,” said Linus in the closing paragraph of A Hundred Thousand Fishes. To celebrate the Sultan’s coronation, a collection of my stories with a royal flavour. At the coronation of HRH Sultan Ibrahim as the state’s fifth sultan in the history of modern Johor, it is timely to look back to the founding of Johor by Temenggong Daeng Ibrahim (1825 to 1862) and the establishment Iskandar Puteri. To open up the jungles in Johor, Temenggong Daeng Ibrahim wisely encouraged Chinese pepper and gambier planters from Singapore and Indonesia to expand their plantations here. The arrival of Chinese labour and capital changed the state’s economic and social structure. The cultivation of rubber made a similar impact through European investment and the import of Indian labour. In the early 1920s pineapple growing was introduced while rubber continued to be Johor’s chief agricultural produce until it was overtaken by oil palm recently. Kampung Wadi Hassan and Kampung Wadi Hana, named after the pioneers, are a legacy of the Arab community in Johor Baru. Members of the Sikh community here were labourers and cattle herdsmen or found employment with the Police and as watchmen and security guards. Agriculture, once the backbone of the state’s economy, and the early development of Johor, brought together pioneering groups of Malay, Chinese, Indian and Europeans in a melting pot of people that form the core community in the Johor raykat today. Ready or not, I’m swept along with the rakyat of Johor in an infectious surge of Royal Fever. All over the city, an increasing number of billboards, banners and buntings are put up with the official coronation logo to send well-wishes to His Royal Highness Sultan Ibrahim on his coronation. Since last week, rows upon rows of Johor state flags strung across the roads are furiously flapping in the breeze like a waving canopy over passing cars. In the last few days, many road users are taking detours to get to their destinations as several roads in the city are closed to facilitate rehearsals. All eyes will be trained on Johor for the coronation of HRH Sultan Ibrahim on March 23 as the fifth sultan in the history of modern Johor. The city is doing everything to spruce up public places while the relevant authorities – in the palaces and throughout the city – are on their toes to ensure that all plans will go smoothly and securely. Local and foreign guests are descending on our beloved city and nothing should go amiss as we roll out the proverbial red carpet to welcome them. The Johor sultan’s coronation is a historic day that’s unique to Johor as it combines Islamic, Malay and Western culture and rituals that are exclusive and based on Johor royal traditions. 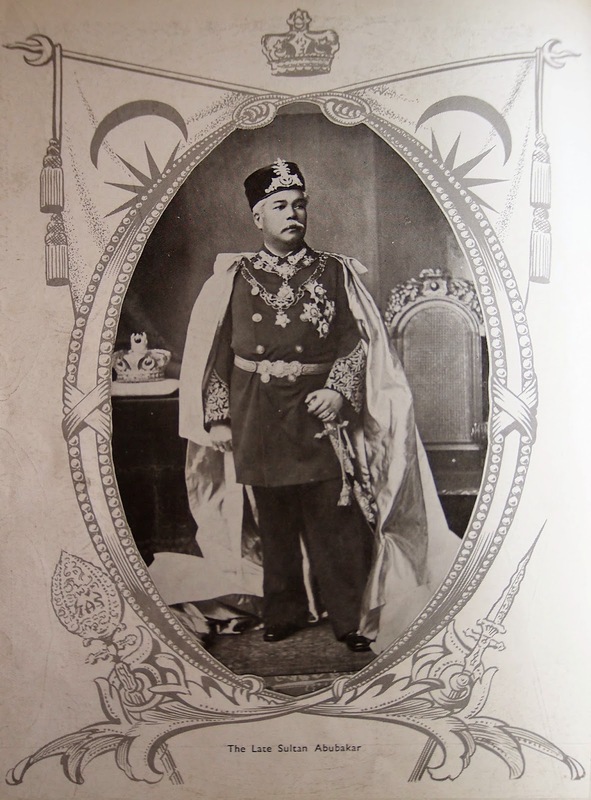 Sultan Abu Bakar – the Father of Modern Johor (1862 to 1895) – adopted the English tradition of pledging the oath of loyalty to the monarchs, the royal regalia and exchanged the traditional Malay head-dress for a crown that was made by royal jeweler, J W Benson of London. For weeks, I’ve been immersed in “sultan stories” as I read history books on early Johor, did online research and looked up old photos. This exercise is both inspiring and informative as I discover the stories and people behind the names of roads and kampungs, as well as the palaces and hills in Johor Baru. I’m literally saturated by a great deal of information but it’s good to know who’s who, what’s where in and around JB and which buildings no longer exist in our fast developing city. Then I get a call from a friend telling me about someone who wants to show me souvenirs in his family’s collection from the last sultan’s coronation 55 years ago. I’m glad I arranged to meet him because he is proof that I’m not alone in this bout of royal fever! He is probably having a more serious “attack” because he is witnessing the sultan’s coronation for the second time in his lifetime! When I left Eh He, the place where our meeting was held, I spotted my friends, the Liew brothers in front of their shop, Johor Heng Photo Studio situated at the corner of Jalan Trus and Jalan Ibrahim. 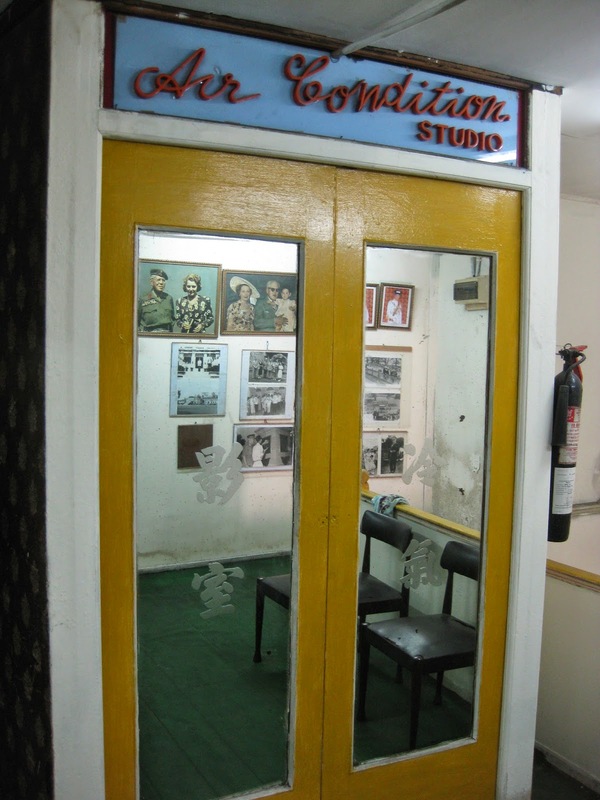 Their father, Liew Wee Peng, started as an employee with the studio when he moved to JB in 1946 and at the demise of the owner, Heng Kok Wee, he took over the business and retained the studio’s established reputation. The senior Liew also took over the role as a royal photographer and a number of his old photographs of Sultan Ibrahim Almarhum Sultan Abu Bakar are still displayed in the upstairs studio. The brothers, Liew Ah Lek (a k a Alex) and Liew Kok Choy, invited me in for a chat and the topic inevitably went to the sultan’s coronation because even Sin Chew Jit Poh, the Chinese newspapers they read, featured the sultan’s crown in an article. Kok Choy turns to that page and points the article out to me but I can only admire the photos because I don’t read Chinese. He looked at me, hesitated a moment and then started to read the article again line by line, translating it into English for me. I listened carefully and was glad the detailed description he translated tallies with what I already know about the sultan’s crown and the smaller crown for his consort. I can hear a tinge of awe and admiration in his voice as he read out that Johor is the only state in the nation where the sultan wears a crown and has a coronation ceremony. I’m sure he is familiar with the sultan’s coronation because we are in their old studio surrounded by priceless photos of several members of the Johor royal family. Check out the priceless photos here! As I look around, my eyes are riveted to shots of Sultan Ibrahim and Lady Marcella, and other photos with a young Princess Mariam. I remember being fascinated by Princess Mariam when she visited our school with Lady Marcella and how my classmates and I were so thrilled to meet a stylish princess. I can never forget her chic elegance with her long hair tied in a pony tail, her simple but smart outfit and those fashionable shades! While looking through my collection of photos, I discover a shot I took for my story on the Raffles Hotel Museum, Singapore. It was of an exhibit of a pair of shoes with matching evening bag made of gold fabric and a vintage-looking blouse designed by Doris Geddes Singapore Couture that belonged to Lady Marcella. Displayed alongside was a newspaper cutting from the Straits Times headlined, “Sultanah crowned in day of splendour” and “The gown: East and West,” that described how the design and fabrics were influenced by Asian and Western culture. From photos I’ve seen of Lady Marcella, I can imagine how stunning she must have looked in the coronation gown designed in pink and silver, as illustrated in the newspaper report with details of the gown and accessories described in the copy. It’s exciting that the Geddes couture collection was housed in The Little Shoppe, Raffles Hotel Singapore since 1947 and her designs are still in demand among vintage clothes collectors. With this beautiful outfit in mind, I can’t wait to see Her Highness Raja Zarith Sofiah in all her finery as she was personally involved in the design of her coronation attire. In keeping with royal family traditions, on the day before his coronation, HRH Sultan Ibrahim will pay his respects and offer prayers to his ancestors interred at the Royal Mausoleum at Bukit Mahmoodiah and at Telok Belanga in Singapore. This trip to Singapore clearly reflects the connection the Johor royal family has with Telok Belanga, the place where Temenggong Abu Bakar Sri Maharaja lived when he succeeded his father to the Johor throne. This style of the traditional costume preferred by His Highness was widely worn in Johor in the 19th century and its popularity flourished during his reign. In 1862 this uniquely Johor style was recognised as the baju kurung Teluk Belanga. For the sultan’s coronation, at least nine different but related events started from March 16 in a grand 3-month long celebration for the rakyat to enjoy not just in the capital city but also in the districts. This tradition was probably put in place from the era of Sultan Ismail who had a good rapport with the rakyat and visited the districts regularly. This might have been the earliest form of the annual Kembara Mahkota that continued to be practiced by Sultan Iskandar and now HRH Sultan Ibrahim and members of the Johor royal family. With all these activities lined up throughout the state, it looks like the effects of the royal fever are set to linger for some time now. Alvin Tan, a San Francisco-based Malaysian artist is holding a solo art exhibition entitled, A Mini Retrospective, from March 15 to April 5, 2015, at Tan Hiok Nee Heritage Walk. This is his first solo show in Johor Baru that features a showcase of paintings that represent his artistic journey from the past to the present day. Tan, a 1976 graduate of the Kuala Lumpur College of Arts, furthered his art education with the Accademia di Belle Arte Roma in Rome. His exposure to the art world abroad and its potential in Malaysia encouraged him to relocate his entire family from Alor Setar to live in Johor Baru in 1982. As his parents and siblings settled down in JB, Tan would commute to work in Singapore with the Nanyang Academy of Fine Arts where he lectured in Western Art History and the Aesthetics of Art and Psychology of Art. In 1989 he continued his education with the California College of the Arts, Oakland in USA. Since 1978, Tan has participated in art exhibitions held in Portugal, Italy, Singapore and the USA where he presented solo, partner and group exhibits. He was among the pioneers of the Singapore Artists Village who joined founder, Tang Da Wu, in the art colony in the late 1980s to exchange ideas and encourage artists in new experiences and experiments. While he continued his art studies with the Academy of Art University in San Francisco between 1991 and 1993, this prolific artist presented a number of solo exhibitions in San Francisco and Singapore. In 1995 he was commissioned to create a wall mural in the Parrot Paradise of the Jurong Bird Park. 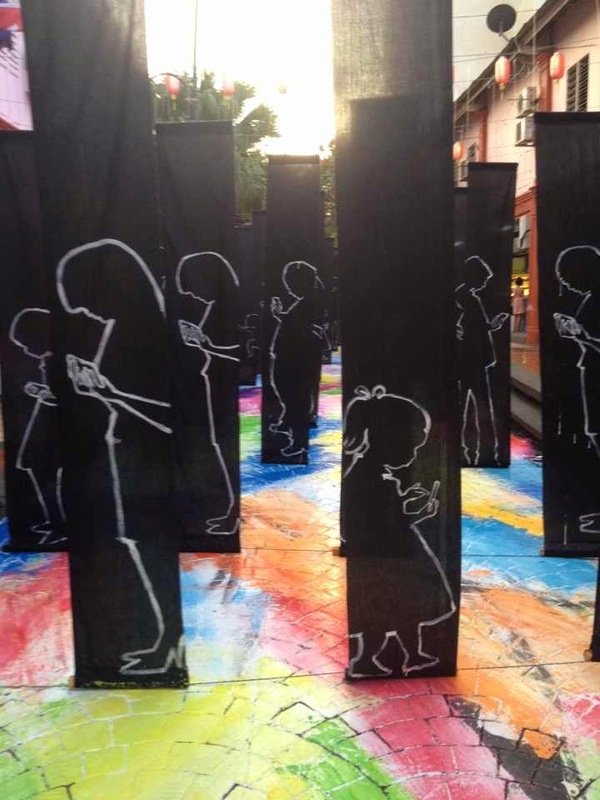 Tan is no stranger to Tan Hiok Nee Heritage Walk as he had the opportunity to create, Connect Disconnect an art installation that occupied a 15-meter length of the street in December 2013. Recently, he completed an art installation entitled, Shelter in the Sky for property developer, Kim Lun Land, for their sales showroom. Art52Gallery is located at 52, Jalan Tan Hiok Nee, Johor Baru. For enquiries, Tel: 016 – 788 2420. “Can you speak Cantonese?” I was asked quite bluntly. “Sure!” I answered confidently because I’m quite sure I will find the right vocabulary to chat with Soo Kok Wah, 72, who is Cantonese and eager to share his memories of the previous sultan’s coronation with me. I’m meeting Soo, a member of the family who used to operate Soo Peng Hang Press, a leading printing company in Johor Baru back in the 1960s. I’m at Eh He for our appointment and the moment the introduction formalities are over, Soo did not hesitate to show me two souvenir items from the previous coronation – a souvenir booklet and a cardboard plaque with the official logo for the sultan’s coronation. In 1960, Soo was just 17 but he has distinct memories of the coronation of Sultan Ismail. At that time, his father and older brothers where running their business and he was still in Foon Yew High School. He joined the family business after he completed his studies. In the 1930s Soo Peng Hang Press was situated in the building where the OCBC bank is located and they shifted to the Foh Chong Building before relocating to their premises at No. 48 Jalan Ah Fook. Soo tells me to turn to the page in the souvenir booklet where their printing press bought advertisement space, to read the full name and address. I noted that in those days, this road name did not have Wong Ah Fook’s surname in it. Soo explained that Sultan Ismail had a good relationship with the local Chinese community and they used to refer to His Royal Highness affectionately as, Lau Sultan which literally means the “elderly sultan.” The souvenir booklet, produced by the Chinese community to commemorate the sultan’s coronation, was printed in Chinese language with just its cover title in English. It reads: A souvenir commemorating the coronation of the Sultan of Johor. He turns the pages and points out the various segments written in Chinese on the order of the coronation programme that included a detailed timetable when the newly-crowned sultan will visit the various districts. I learnt that Sultan Ismail had a good rapport with the rakyat and was already visiting the districts regularly. It occurred to me that this might have been the earliest form of the annual Kembara Mahkota that continued to be practiced by the late Sultan Iskandar and now Sultan Ibrahim and the royal family. 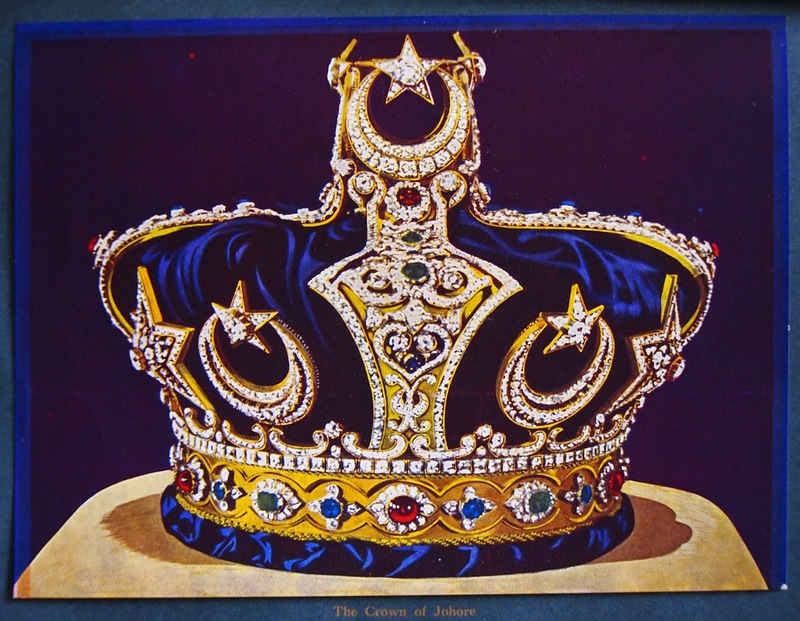 There were also photos of the crown that’s unique to Johor with its description, the royal couple – Sultan Ismail and Sultanah Aminah – and brief information on Chinese businesses that were established in JB during the sultan’s reign. From the number of advertisements printed in the booklet, I get an impression that the business community was united in their effort to commemorate the sultan’s coronation. One of his favourite memories of Sultan Ismail is the printing of Hari Raya cards. One particular year, the sultan wanted to print his greeting cards using the Gothic font, a typeface similar to the one used by the older version of the Straits Times masthead. The Government printing department did not have this font so they tried to track it down from other printers and they finally found this particular font at Soo Peng Hang Press! At that time, the machine they used employed the manual typesetting method and was a pedal operated unit. When Soo’s father was approached by the Government printers, he invited them to do the typesetting of the required words to create a mock-up for the sultan to review. Upon the sultan’s approval, Soo’s father let the Government printers borrow the required typeface to print the Hari Raya greeting cards for the sultan! Soo clarified that the commemorative plaque is made from cardboard and was bought from a supplier for display at their printing press. He said that businessmen in town displayed a similar plaque next to their signboards during the sultan’s coronation celebration in 1960. After the celebration, the plaque was taken down and stored away but when he heard about the coronation of Sultan Ibrahim on March 23, Soo dug out these precious mementoes to share with his family and friends. Compared to the digitally created commemorative banners and buntings for the coronation of Sultan Ibrahim, the cardboard plaque produced for the coronation of Sultan Ismail some 55 years ago is quite good by the standards of the day. The design is simple and the ink is colour-fast and still shining quite brightly after so many years. It’s interesting that the print on the bottom left reads: Coronation of H. H. Sultan, Sir Ismail, Johor, and used an honorific that recognised his knighthood honoured by the Queen of England. “Don’t forget to mention that the Sultan had a good relationship with the Chinese community,” Soo reminded me more than once and I reassured him that I will not forget. I can’t help suppressing a smile because I can sense his pride as he is privileged to witness yet another sultan’s coronation in his lifetime. Then I told Soo that he must look for old photos from his family album that I may use when next write a story about his family business in JB. As I take my leave, I privately congratulate myself for doing quite well in conducting our conversation almost entirely in Cantonese! I’m a bit rusty but if I may say so, it was really not bad at all!